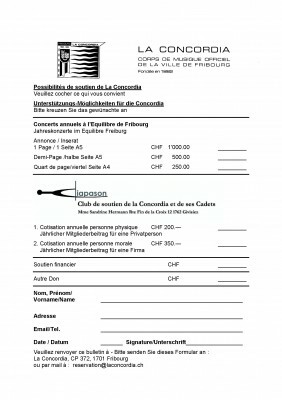 Concordia publishes a programme for each of its concerts. You are thus able to place an advertisement in the programme. You will find the rates for the current season below as well as several forms to fill out. We would be pleased to include you as one of our advertising sponsors. Your aid will help us to fulfil our numerous obligations that come about by organising concerts during our musical season.